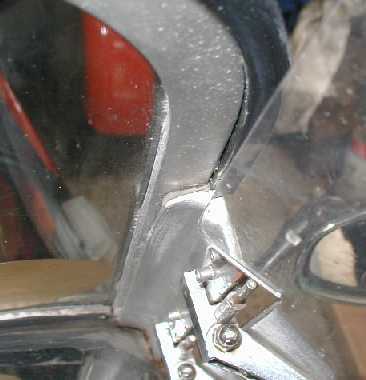 One of the problems with Robin Hoods, is the way that the windscreen is mounted onto it's brackets. 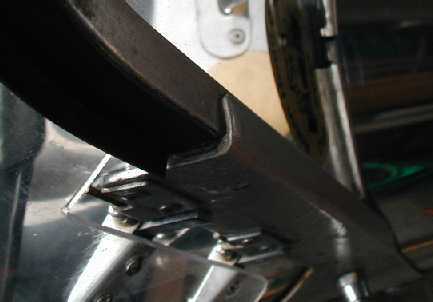 RHSC instructions are to secure by 3 self-tappers into the frame from either side. Anyone who's ever been in, or followed a Robin Hood when the weather gear is fitted, will know just how much strain is placed on the windscreen, and to only have it secured by a few small self-tappers isn't the safest of methods. They will work loose, and over the years, they will corrode & rust. 1 will "let go" and the next thing you've got at the very least is a broken screen. Before fitting the screen, I recommend that the side mountings are modified by welding a strip of metal to the mounting, both along the front edge, and another onto the side, thus making a channel for the screen frame to side unto. The welds etc can be dressed up so as not to be seen.